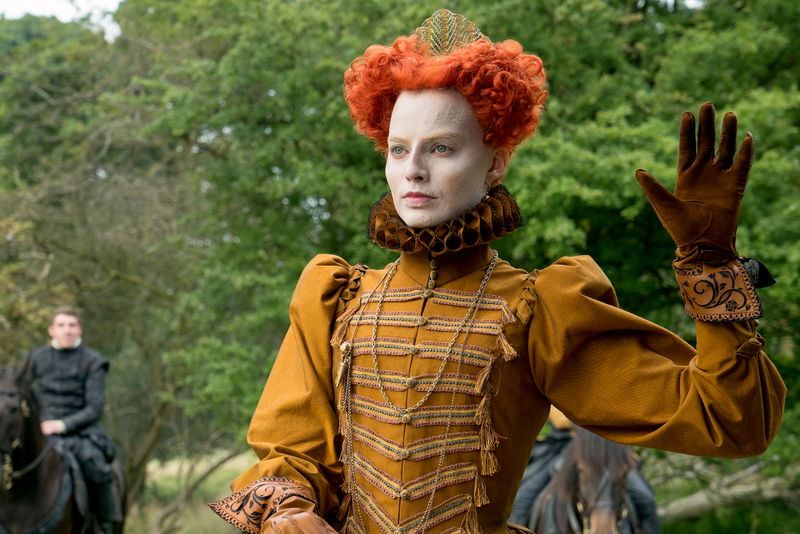 A plot breakdown of Mary Queen of Scots is a big ask, especially if you want to take into account the political, religious, and sexual complexities of late 16th century England and Scotland. 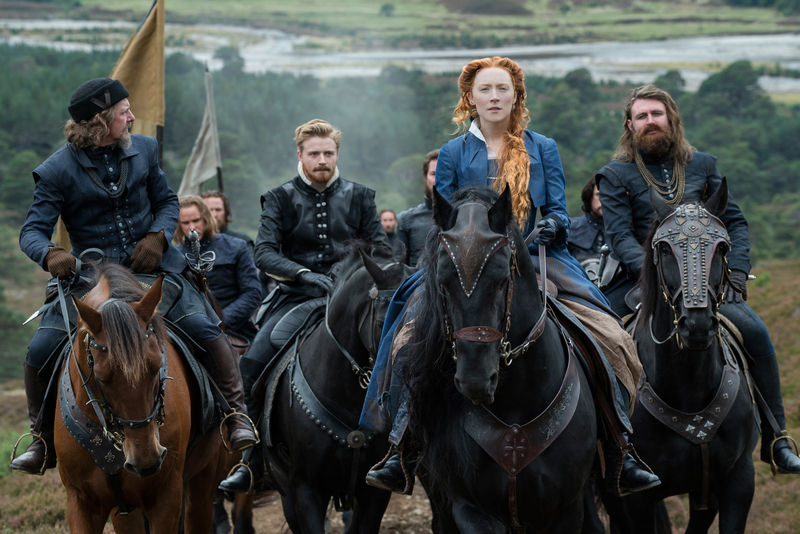 In the shell of a nut, Mary Stuart (Saoirse Ronan), former Queen of France and rightful Queen of Scotland, returns to the latter after living (since the age of five) in the former to press her claim to the throne. This is bad news for England in general and Queen Elizabeth I (Margot Robbie) in particular. Mary also has a strong claim on the English throne, and Elizabeth is aging, unmarried, and has not produced an heir — in the event of her death, the Scottish Queen could rule England as well. And yet, while they have plenty of cause for enmity, the two monarchs have much in common: they are both women ruling in an age of strong patriarchal dominance, they both must balance their personal desires for love and family against the demands of state, they both must defend themselves against the machinations of powerful men. Can sisterhood grow from rivalry? Bow down to Margot Robbie. The Queen commands it. Well no, not if you’ve read a history book, and one of Mary Queen of Scots’ biggest issues is the contradictions between the story it wants to tell and the recorded facts of the events. Not that it doesn’t make a good fist of it: you can almost literally see the film straining at the seams with the effort of containing all the details and ideas that screenwriter Beau Willimon, The Ides of March (2011), tries to fit into its two-hour running time. The dynastic struggles are, as expected, the core element, paired reasonably well with the obvious (and welcome) feminist themes, but add into that strong but isolated notions of religious strife (personified by David Tennant as John Knox, founder of the Scottish Protestant Church), rather modern ideas about sexuality and gender (Ismael Cruz Córdova’s Italian courtier is genderfluid and has a one night stand with Jack Lowden’s Lord Darnley, Mary’s second husband), and the sheer effort of encompassing a good quarter-century of history (except no one ages), and you’ve got a movie that’s simply pulling itself in too many directions. Which is rather baffling because there’s a strong central character right there in the form of Ronan’s Mary, and potentially fascinating relationship between her and Robbie’s Elizabeth to be explored. Not only is that prospective material left unexamined, but we don’t even get much insight into Mary as a character — she flips from righteous to ambitious, prudent to reckless, humble to arrogant, from one scene to the next, and while Ronan is great in the role in the moment (and every moment) the inconsistency of characterization does her no favors. Robbie’s Elizabeth is more or less a sideshow, although it’s easy to picture a version of this film where the two women’s lives are more effectively and dramatically set parallel. The film asserts that Elizabeth’s bout of smallpox at the age of 29 virtually sent her off the rails for at least a while there, affecting her statecraft and policies — in effect, though, all it does here is give Robbie the chance to ugly up for another grab for awards season glory (see also I, Tonya). Later on, the film makes the case that Elizabeth sacrificed her entire persona to the demands of the throne, a claim also made in the much superior 1998 film, Elizabeth. Mary Queen of Scots clunkily communicates this notion by simply having Elizabeth narrate it. The whole thing builds to a climactic one-on-one meeting between Mary and Elizabeth à la De Niro and Pacino in Heat (1995), but any dramatic effect is scuppered by the preceding uneven 90 minutes and another sudden, inexplicable change in character from Mary. Following this, all that’s left for the audience to do is wait for the historically mandated inevitable (ker-chop!). Debut feature director Josie Rourke’s approach is as scattershot as the material, at certain times utilizing handheld cameras to capture the action, at others going for a more classical, stately style (one shot of conspirators crowding around a desk is a straight-up Vermeer lift). A veteran theatre director, Rourke is lauded in that field but, while she acquits herself fairly well with her big screen debut, does nothing here to elevate Willimon’s sketchy script. She does, however, bring with her the theatre’s penchant for color-blind casting, which may fly in the face of historical accuracy (and if that’s your main beef vis a vis historicity in this thing, you need to have a hard think about yourself) but does mean that we get the pleasure of having Adrian Lester, The Day After Tomorrow (2004), as Elizabeth’s ambassador to the Scottish court, and Crazy Rich Asians’ Gemma Chan as Bess of Hardwick, Elizabeth I’s chief lady-in-waiting. They’re part of a robust ensemble that also includes Guy Pearce, The Proposition (2005), as William Cecil, Elizabeth’s chief political advisor; Martin Compston, Sweet Sixteen (2002), as Bothwell, Mary’s bodyguard and later husband (she goes through ‘em); and more familiar character actors than you can shake a stick at. Here and there a performance strikes a flat note, though — Jack Lowden, Dunkirk (2017), is occasionally too modern in his affectations as Lord Darnley, Mary’s feckless consort, while David Tennant, Fright Night (2011), is pretty one-note as the ranting, staunchly anti-Catholic cleric, John Knox (it’s not his fault — it’s all he’s given to do). Elsewhere, character motivations are often difficult to parse, being concealed by layers of protocol, manners, and custom to the point where the loyalties and ambitions of various supporting players are difficult to discern right up until they finally act. That may, indeed, be the point, but it does make engaging on any meaningful level with both the characters and the plot more difficult than it should be. 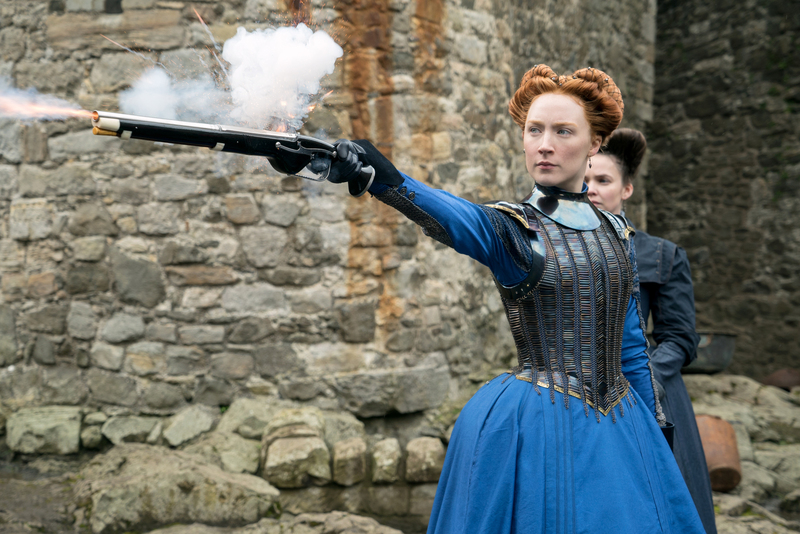 Mary Queen of Scots is undoubtedly an ambitious film. The late Tudor period is a huge and fascinating canvas, and you’ve got your work cut out for you trying to dramatize even a fraction of the massive political, social, and religious changes of the late 1500s, so top marks for effort. The film falls short of its implicit goals, though. If you’ve a soft spot for historical costume dramas, it’s worth a look, but it’s got no chance of being your favorite.